I realize that just a couple of posts ago, I blogged about my inability to dance. https://gstoutimore.wordpress.com/2011/08/11/when-momma-g-got-her-groove-on/ But yesterday, my nephew Ben got married, and as everyone knows, if you love someone, you have to dance at his wedding. When Ben was growing up, he lived in Michigan, so I saw him rarely. I knew little about him except that he was a cute little boy who once threatened his younger cousin (my son) with his nunchucks in my mother’s backyard. Several years later, Ben moved to New England, a handsome and soft-spoken young man with sparkling sapphire eyes, a quick smile and not a menacing bone in his body. He forged a life for himself in New Hampshire, and a few years later, began bringing a beautiful special friend- Heather- to family parties. And yesterday, despite an oncoming hurricane, Heather and Ben stood at the edge of the sea and exchanged marriage vows. As soon as the ceremony ended, the rain began and a short while later, we found ourselves sitting at round tables under a large tent. Despite drips and drops from the sky, the atmosphere was festive. The tables were covered with bright yellow and blue, the sunflower centerpieces a jubilant fanfare of summer’s end. Heather and Ben danced as husband and wife, joined by their parents and the wedding party. More people joined in and I watched from my seat, as I usually do when there is dancing. Despite my years of swaying and swinging with my babies, I am still awkward and unsure when it comes to moving to music. Besides, in a world comprised of duos, I am painfully aware that I am no longer part of a pair. The song ended and the dance floor cleared, but the DJ played on. I chatted with my brother and then hearing applause, turned to see my nephew Joshua alone on the dance floor. Joshua has Down Syndrome. He is short and stout with big brown eyes that squint to see through thick glasses. He is guiless and sweet spirited, and because he likes everyone, thinks everyone will like him. Unabashed, Joshua launched into a freestyle interpretation of the music, moving to the beat, empowered by the cheers and clapping that ensued from the on looking crowd. Within a moment, Heather joined Josh, and soon after, Ben. Before the song was through, the dance floor was packed. I watched my brothers and sisters, nieces and nephews bobbing in cadence and wished I was free like Joshua. The song ended, and immediately another one began. My brother Kevin grabbed my hand and pulled me to the dance floor. Reluctant at first, I hesitated. And then I realized that I could sit on the sidelines and watch other people revel, or I could take a chance. Take a chance like Heather and Ben who have no guarantees that they will be able to withstand the hurricanes that will surely come into their lives. Take a chance like Joshua, whose desire to celebrate life outweighs his disabilities. So I danced. Badly. But I danced. And it was fun- more than fun. It was elating. Because life is about taking chances. Taking chances on young love, taking chances on acceptance and taking chances at looking foolish. So congratulations, Ben and Heather. Thank you for allowing me to dance at your wedding. I love you. 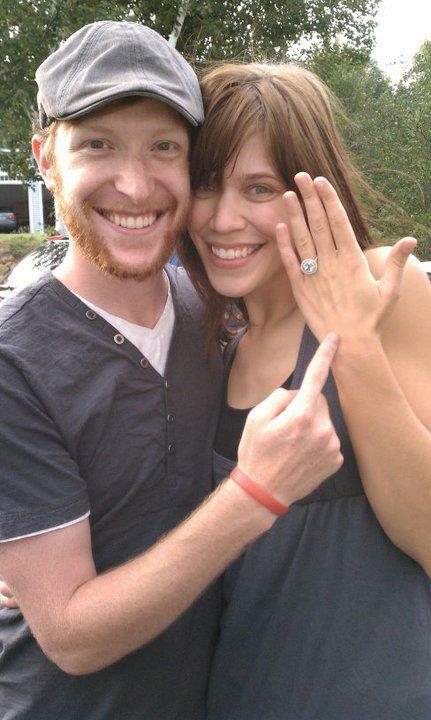 My daughter Abby got engaged last week. The day before he proposed, her fiancé, Johnny, showed me a picture of the ring and told me of his plans to propose. The picture did not do the ring justice. It is breathtakingly beautiful and is outshined only by the smile on my beautiful daughter’s face. It is a series of circles, the symbol of love itself. 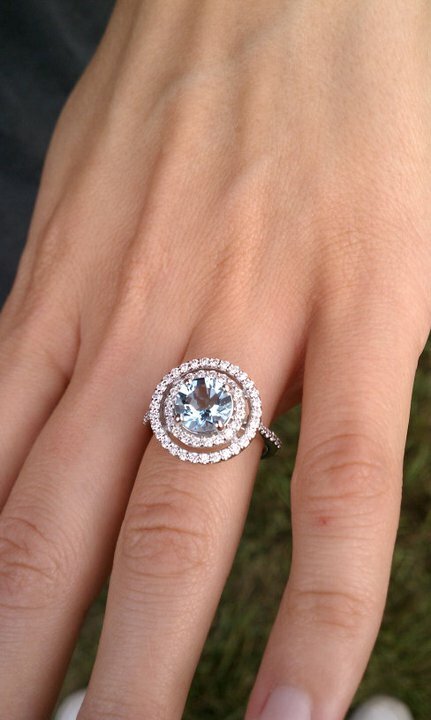 The center is a round aquamarine, and around it are two halos of tiny diamonds. The two halos are like Johnny and Abby- two separate individuals, the aquamarine the blending of two colors- green and blue, like the melding of two lives to become one. I never had an engagement ring. We were VISTA volunteers in Idaho in the late seventies, and were paid $240 a month, plus food stamps. Diamonds were not in the budget. But for our wedding, my intended and I bought matching gold bands, engraved with floral filigree. We began our search for rings in Boise, Idaho, where we were stationed, and found the set on display at the first jeweler we visited. Immediately, we fell in love with the rings, but decided to continue our search, in case we found something we liked better. After several more shopping trips, we decided to return to the original jewelry store. My children’s father was a farm boy, with large hands and meaty fingers. My hands are not small either, so when we asked to see the rings, we expected to find them both too small. To our surprise, both rings fit our fingers perfectly. We decided it was kismet and bought them on the spot. When we exchanged them at our August wedding, we promised to wear them always, blissfully ignorant of the storms that awaited us. For the next twenty-eight years we wore these golden vows, until Paul had a minor accident which flattened his ring. His finger swelled painfully and it was obvious that the warped and twisted ring had to be cut off. By this time our marriage was as troubled as his finger and as I wedged a ring cutter under the gold band, I noticed that the filigree had disappeared, worn smooth over the years. It did not resemble the ring we bought at that little jewelry store in Idaho, any more than our marriage resembled the two young lovers who had purchased it. As I gripped the cutter and snapped the ring in two, my eyes filled with silent tears, knowing that breaking the band that symbolized our union was a foreshadowing of the lonely nights ahead. When we divorced I removed my wedding band and placed it in the padded protection of my jewelry box. Occasionally I pick it up for a short moment, and then return it to the velvet lined case. Like my marriage, I can no longer wear it, and yet I cannot bear to turn my back on it. I tried a few days ago, when the rising price of gold enticed me to a jewelry store that purchases precious metal. I thought I would sell the ring and use the cash to help out with Abby’s wedding expenses, and drove to a local jewelry store while trying to convince myself that it was only a useless circle of ore. But the lump in my throat wouldn’t go away and when the jeweler told me that it was worth only a fraction of what we paid for it, I took it back home to lie in wait with the earrings and brooches that fill my jewelry box. People often say that a wedding ring symbolizes the never-ending love of a husband and wife, but I believe it symbolizes the continuity of love itself. The love symbolized in that gold band produced three beautiful children who will love three beautiful children who were produced by the love symbolized in a little gold wedding band. Abby and John will love each other in a way that is as unique as the aquamarine ring that signifies their promise, but as traditional and continual as the love that produced their very existence. It is the circle of love. It is the circle of life. Last night I watched “So You Think You Can Dance” on television and marveled at the way the young contestants moved their bodies in graceful expression to the strains of popular music. I could not help but think about my own career as a dancer. My mind wandered way back to a Halloween evening when I was around seven years old. My gypsy costume was ready, complete with dangling gold hoops my mother screwed to my ear lobes. She tied a silk scarf from her top drawer around my head and lined my eyes with a dark Mabelline eyebrow pencil. As she and my father gathered our brood together to go trick-or-treating on Green Street, my mother asked me to run upstairs and get something she left in one of the bedrooms. I bounded up the stairs excited beyond containment. As I stood on the linoleumed bedroom floor, my enthusiasm reached a crescendo, and I spontaneously broke into what I believed to be a magnificent tap dance. “Stop that racket and get down here!” my mother yelled. And at that one short sentence, my career as a dancer was forever ended. My father loved to dance. He would put jazz records on the hi-fi and dance first with my mother and then my older sister, Martha-Jean. I watched them cover the living room floor with intricate steps and turns, patiently awaiting my turn. Taking me in his arms, Dad would try a few steps. But I, so eager to please, would jump ahead, or turn in the opposite direction as he. It is hard to relax when you are trying too hard. I disentwined my arms from his and sat down, cheeks burning, while he gathered up Martha-Jean again, and Two-Stepped in the other direction. Later, when I was in eighth grade, my parents sent me to dance school where every Saturday evening pimply faced boys and girls dressed up and practiced the Waltz and Fox Trot while secretly wishing they were home watching “Man From U.N.C.L.E” on television. I tried learning the steps, but hated the humiliation of waiting to be chosen as a partner by some sweaty handed teenage boy I didn’t know. One Saturday, after stumbling through three minutes of Winchester Cathedral with a skinny boy who had Brylcreem dripping down his forehead, I decided that I was done with ballroom dancing. Fortunately for me, ballroom dancing was replaced by rock concerts and choreographed dance steps gave way to free-form bobbing in time to the beat of the drums. 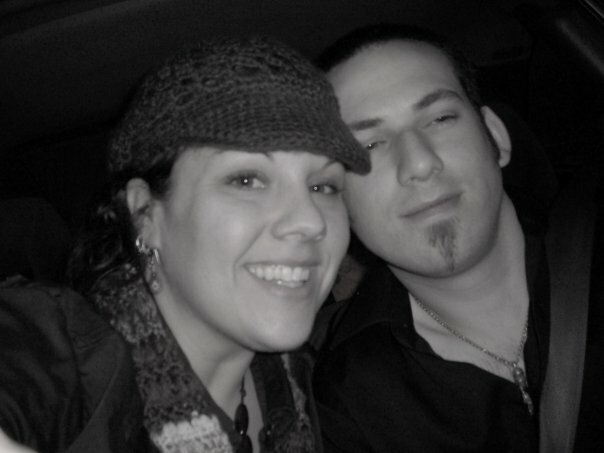 I managed to figure out a way to move my body in a way that allowed me to blend in with the scenery, and when I met and married the man of my dreams, I was not unhappy to find that he was content to play in the band instead of dancing to the music. But then there were children, and I quickly learned that if there is a baby, there is movement. Babies loved to be rocked and jiggled, and shortly after giving birth to my first sweet child, I realized that dance had to be a part of my life. So in the living room of our house, with nobody but a pink little newborn, I learned to dance. Here’s the thing about babies. They think everything you do is great. All three of my babies loved nothing more than to be scooped in my arms and waltzed around the living room. They chuckled to a Cha-cha-cha. 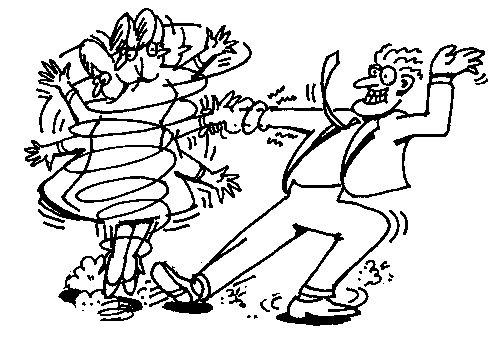 They were tickled with a Tango. They marveled at a Merengue. For the next several years, whenever there was music on the stereo, they begged me to boogie. The kids are all grown now, and the only dancing in my living room takes place on the television screen. But early in the morning, I listen to my IPod while I put on my makeup, and every once in a while I catch myself swaying across my bedroom floor in silent familiar steps. Watch out Fred and Ginger- Momma G’s got her groove on.